QUEZON CITY - After seven years, UE Lady Warriors got their most number of wins today after beating the Adamson Lady Falcons in three sets, 25-14,25-19,25-22, Saturday afternoon at the Smart Araneta Coliseum. Lady Warriors Captain Roselle Baliton and Mean Mendrez led the Warriors win with 14 and 15 points respectively. 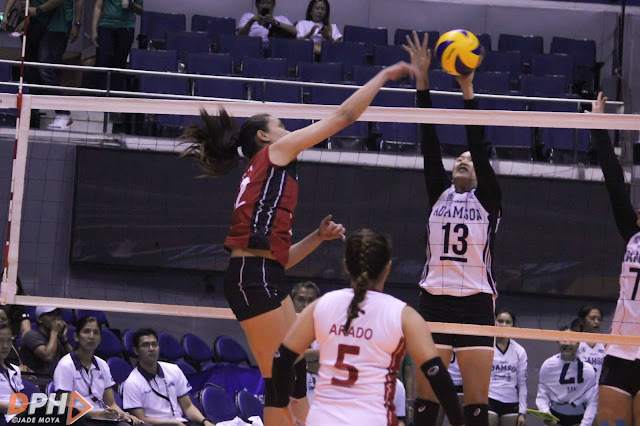 Mendrez scored 15 points with 11 attacks, three aces and one kill block while Baliton got 14 points and six kill blocks. Judith Abil also contributed 11 points with 18 digs and 19 excellent receptions for the Warriors win. Lady Falcon Bern Flora is the only double digit scorer as she got 10 points at the Falcons loss today. With that, UE Lady Warriors is now on 3-9 while Adamson got their eighth straight loss with a 1-11 standing. UE Lady Warriors will try to improve their winning streak as they will face the DLSU Lady Spikers after the Holy Week break on April 24, Wednesday, 2 p.m., at the Filoil Flying V Centre at San Juan while the Adamson Lady Falcons will try to bounceback as they will face the Ateneo Lady Eagles on the same day, 4 p.m., at the Filoil Flying V Centre.